Leading provider of nuisance odor investigations in Florida and the Orlando area. If you've ever had a nuisance odor issue within your home or office you can appreciate the difficultly in identifying the odors, the sources and possibly even responding to questions from your family or employees. Strange and/or nuisance odors can appear in everything from single family homes and multi-family structures to office buildings and industrial complexes. Quite often when the source of these mysterious nuisance odors can’t be identified the services of an indoor air quality (IAQ) professional is required. Often nuisance odors are intermittent; they come and go. Sometimes the intermittent timing of the odor can be associated with building related patterns such as the running of mechanical equipment, cleaning, or deliveries. Often the odors are associated with outdoor events such as wind and rain. Changing pressure relationships both inside and outside of a building can cause air to flow from unoccupied regions, where nuisance odors are expected, into occupied spaces where they are not supposed to be. These unoccupied regions can be such areas as attics, crawlspaces, interstitial wall spaces and other cavities. The easiest and most effective way we know of solving intermittent odor problems is to investigate the problem when the odor is present in areas where it is in not expected or wanted. Once the odor has been positively identified and is present, locating the source consists of generally just following it back to the source. The most difficult assignment for an investigator is to determine the source of an odor that is not there at the time of the investigation and where no positive identification has been made. 3. the specific time and date the odors occurs. This is best accomplished by using an odor log. Keeping a log of when the odor is present in particular locations and the duration can enable an investigator to trace to the source by determining where it first occurs and to what locations it travels. 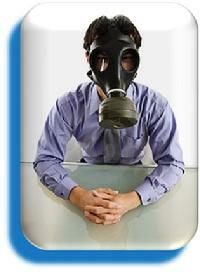 The presence of an odor in a home or office is a clear indication that there is a problem that must be resolved. It's important to note that while some odor causing compounds can be simply categorized as being a nuisance others are potential health hazards. These are all common descriptions of unpleasant and nuisance odors that most people find disturbing or distracting. People affected seldom care about the source or cause of the odor; they just want it to go away. Not many companies actually specialize in investigating odor problems. There are no “magic sniffers” that can either determine the constituents, the source or the cause of an odor. It appears to be the case that the best tool still in tracking down an odor is the trained and sensitive nose. Add to this tool a thorough knowledge of building science, a wide variety of odor causes plus factors and driving forces affecting air pathways. With this specialized knowledge and the common tool (nose) along with chemical smoke tubes, the causes and sources of odor problems can be located and guidance can be provided on steps to take to eliminate them. The purpose of the chemical smoke is to determine pressure relationships when the odor is present for the purpose of tracking it back to its source.